Huikau? : Sign of the times? Is this a sign of the times? The heading tells me there will be "Java" books here... but the first two rows are all Python, PHP, Ruby/Rails and a little TCL book in there for good measure. :) Dynlangs (scripting languages) are beginning to take the front seat for development these days... do the folks at this store know this? Or was this a simple stacking slip? With projects like JRuby, Jython and the like gaining steam as viable alternatives to the Java programming language on the JVM... maybe the heading should just read "JVM" and this stacking order would work just fine! I noticed that myself last time I was in there. 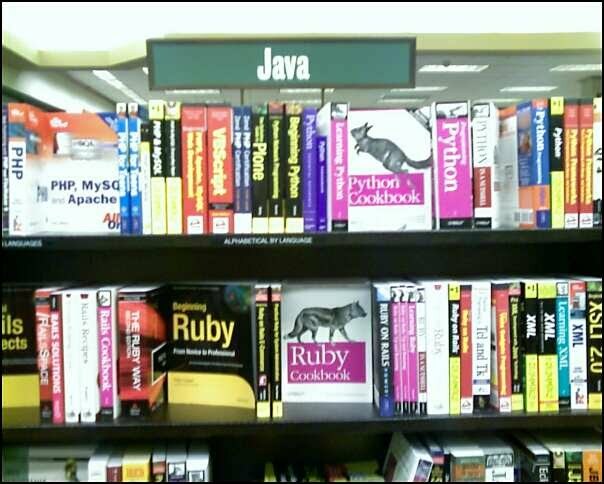 Seriously, though, I think the better thing to do rather than label it "Java" would be just "Programming Languages."